Source: U.S. Bureau of Labor Statistics, Current Employment Statistics and Baker Hughes North America Rig Count. Note: Rig counts are U.S. totals for oil and natural gas, including offshore. Weekly rig count data are converted to monthly data by taking the average weekly readings each month. 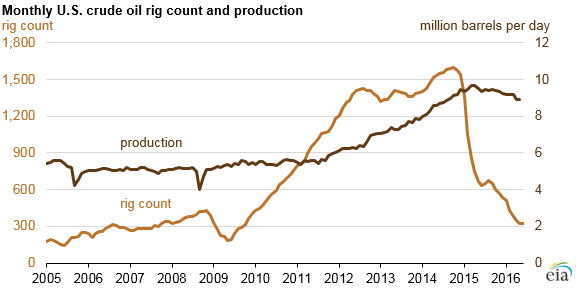 Source: U.S. Energy Information Administration and Baker Hughes North America Rig Count.